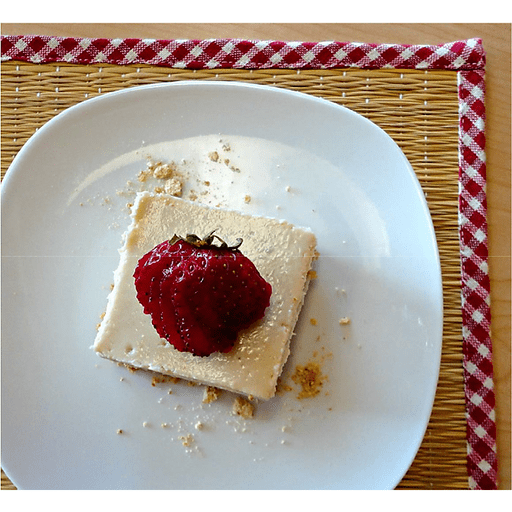 These Strawberry Cheesecake Bars have the same creaminess and delicious flavor as regular cheesecake, but are lighter in fat and calories. Enjoy with caution … you may not be able to stop after just one! 1. Preheat oven to 325°F.. Place about ½ sleeve graham crackers in to a sandwich baggie, seal. Crush graham cracker pieces using a rolling pin, until they are crumbs. In a small bowl, stir graham cracker crumbs and melted butter, using a fork to combine. 1. Transfer to an 8-in square baking dish, pressing firmly into dish. Bake crust until golden, 10-12 minutes. Remove and set aside. 1. To make filling, place Greek yogurt, cream cheese, sugar, eggs and flour in a bowl. Whisk on high using hand mixer or food processor and blend until smooth. Pour mixture into crust and bake until firm around edges while center still jiggles, 30-35 minutes. 1. Cool on wire rack for 30 minutes, then cover and refrigerate for at least 2 hours before slicing. Top each square with strawberries and serve. For gluten free: Use gluten free graham crackers in place of graham crackers. Use gluten free flour in place of all purpose flour. Calories 190, Total Fat 9g(Saturated 5g, Trans 0g), Cholesterol 70mg, Sodium 150mg, Total Carbohydrate 20g (Dietary Fiber 1g, Sugars 14g), Protein 6g, Vitamin A 8%, Vitamin C 20%, Calcium 8%, Iron 6% *Nutritional values are an approximation. Actual nutritional values may vary due to preparation techniques, variations related to suppliers, regional and seasonal differences, or rounding.